It is funny how things happen by chance. Barbara is a British, CELTA qualified, English language teacher who uses ISL Online as a virtual classroom for her online courses. There I was teaching English online through Skype which was restrictive and limited. Meanwhile, my husband was using ISL Online software for remote support, website chat and webinars. What was the chicken and egg in my case? How did it happen? One day I just used ISL Groop with my student instead of Skype. I had found it frustrating teaching her grammar on Skype so I thought about ISL Online. I suggested it to my student and she agreed to try it. We have both never looked back. She now prefers using ISL Online and so does her son for English lessons. Yes, Skype is great for developing speaking skills through conversation and role play, but the basic service doesn’t provide other facilities or teaching opportunities. Yes, you can use a whiteboard and direct a camera at it and teach on Skype this way, but the student can only respond on Skype or maybe on their own whiteboard at home. 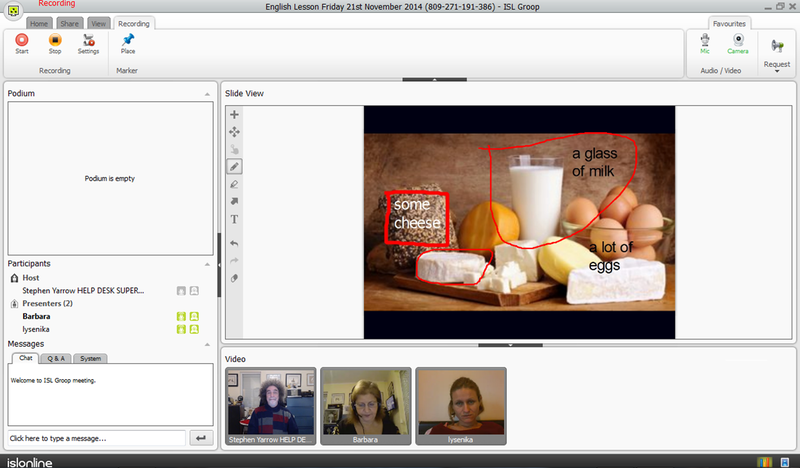 ISL Online is my virtual classroom with an interactive whiteboard. It enables me to give written feedback, corrections, to highlight words, phrases and sentences almost immediately. It enables me to import images and label parts of the images which are great for the development of vocabulary. These images also create a good focal point for a student to practise speaking using descriptive language, therefore developing these skills. 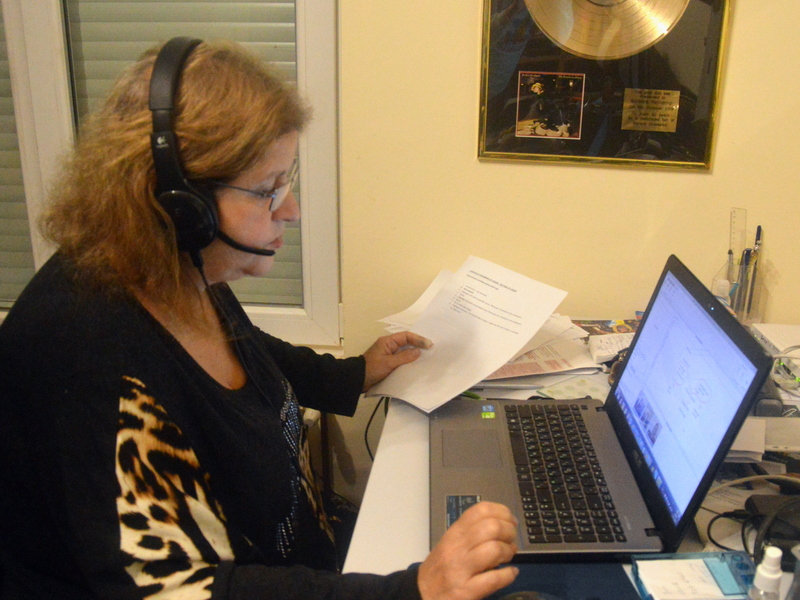 Barbara and her students use slides, whiteboard and chat, while they communicate through VoIP and video. ISL Online is also a virtual classroom with an interactive whiteboard for individual students or groups of students which they can use in so many ways. It enables the student to form complete sentences, explore grammar terms and to respond verbally or in writing to the material presented to them. It also enables them to develop skills in specific areas such as giving directions, understanding the use of prepositions (in, on, at etc.) and using quantifiers (every, most of etc.). Using arrows, pictures of items or simple drawings on the whiteboard enables complete clarification of these specific areas of learning. This facility is very important for beginners and intermediate students. It can also assist those students who are already learning English in a real classroom but may require extra support on a one-to-one basis. www.english4success.eu – is a new online English language school with experienced and qualified teachers. Less expensive than their main online competitors with a virtual classroom, it offers similar courses and is even planning to expand into other languages. www.islonline.com – is the go-to solution for secure remote computer access, fast remote support, live chat and web conferencing for the enterprises. Share screen and turn on VoIP and video conferencing to enjoy interactive online presentations and meetings over the Internet. Meet online for productive teamwork meetings or host webinars to reach a large audience. This entry was posted in ISL Groop, isl online, online meeting, web conferencing and tagged online collaboration, online courses, virtual classroom, web conferencing. Bookmark the permalink.